Alcohol is a known carcinogen that has been directly linked to many chronic health conditions, such as cancer, diabetes, and liver disease. While cannabis has been shown to be much less harmful, and a potential alcohol-substitute, recreational consumption was only recently legalized with the passage of the Cannabis Act in October 2018, and it still faces much heavier-handed regulation than the alcohol industry. A new white paper released by Hill Street Beverage Co. (TSX-V: BEER) makes the case for parity in alcohol and cannabis beverage marketing, promotion, and distribution in Canada. In fact, the paper argues that allowing cannabis-infused and alcoholic products to co-exist on retail shelves together could produce a $4 billion per year cost savings. These savings would come from lower health care, criminal justice, and lost productivity costs. Alcoholic beverages cost the country upwards of $14.5 billion in health care, criminal justice, and lost productivity, according to Hill Street’s new whitepaper, which is much more than the estimated $1 billion cost associated with cannabis. Alcohol is a known carcinogen that has been linked to many chronic health conditions, such as cancer, diabetes, and liver disease, while cannabis has far fewer side effects and perhaps even some benefits. In fact, alcohol accounted for about 40 percent of the $38 billion abuse burden to Canadians, while almost 70 percent of the costs came from alcohol and tobacco. Cannabis accounted for just $2.8 billion in costs, but most of those costs came from criminal justice rather than health care sources. The legalization of cannabis could dramatically lower these cost to just $1 billion per year, which is the figure cited in the white paper’s research. There’s little doubt that cannabis is a safer and less impactful alternative to alcohol. By repackaging cannabis into more familiar beverage formats, it could replace a meaningful amount of alcohol consumption and improve public health. The key is having the products placed in the same location as alcohol products to ensure that consumers have the option when they’re making their purchasing decisions. 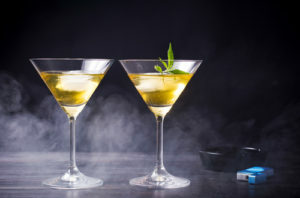 While cannabis edibles are a problem with youth, adult-format beverages like beer, wine, and cocktails have already established an understanding that substances are available for purchasing at existing and reputable licensed outlets with strict guidelines. This also extends to staff members that are well-educated that alcoholic beverages aren’t intended for sale to persons under the legal drinking age. Hill Street’s white paper argues that roughly one-third of the Canadian population may opt for cannabis-infused beverages rather than alcoholic beverages, based on usage studies from Deloitte and other sources. This means that demand could be roughly 65.5 million standard cases of 24 bottles each year. By applying the cost reductions, the company estimates that these converts could reduce societal harm and cost by $4 billion per year. In addition to the lower costs, the company estimates that there could be 25,700 fewer hospital visits from overconsumption of alcohol and a seven percent reduction in violent crimes that are fueled by alcohol. The key is ensuring that consumers have an easy-to-access and easy-to-understand alternative on the shelves that they can purchase and consume.